(Nanowerk News) Japanese researchers say they have developed a rubber that is able to conduct electricity well, paving the way for robots with stretchable "e-skin" that can feel heat and pressure like humans. The material is the first in the world to solve the problems faced by metals – which are conductive but do not stretch – and rubber, which hardly transmits electricity, according to the team at the University of Tokyo. 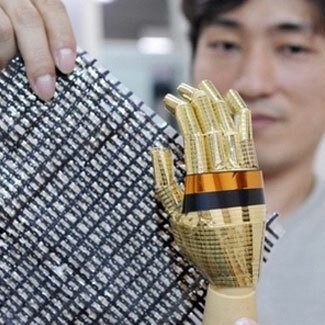 One application of the material would be artificial skin on robots, said Tsuyoshi Sekitani, a research associate in the team. "As robots enter our everyday life, they need to have sensors everywhere on their bodies like humans," he told AFP. "Imagine they bump into babies. Robots need to feel temperatures, heat and pressure like we do to co-exist. Otherwise it would be dangerous," he said. The material itself can be stretched up to 2.3 times the original size but conductivity drops roughly by half at the maximum extension. It can be stretched by 38 percent with no significant change in conductivity -- still a breakthrough considering that metal wires break on strains of one to two percent, the team said. The material is made by grinding carbon nanotubes, or tube-shaped carbon molecules, with an ionic liquid and adding it to rubber. Carbon nanotubes often bunch up together but the millimetre-long tubes coupled with the ionic liquid can be uniformly dispersed in rubber to realise both high conductivity and flexibility. Sekitani said the new material could be used on the surface of steering wheels, which would analyse perspiration, body temperature and other data of the driver and judge whether he or she is fit enough to drive. "It could be completely integrated into the normal driving system, making users unaware of using it," he said. Or it could be used on top of a mattress for bed-ridden people, watching if some parts of the body were under constant pressure and tilting the bed to change the patient's posture to prevent bedsores, Sekitani said. "Objects that come into contact with humans are often not square or flat. We believe interfaces between humans and electronics should be soft," he said. The material could also give birth to a stretchable display, allowing people to take out a tiny sheet and stretch it to watch television. The team aims to put the elastic conductor to practical use in several years, Sekitani said.